BLOOMINGTON, Ill.— Illinois Wesleyan University Chair and Professor of Chemistry Rebecca Roesner has been named the 2017 recipient of the James D. Dougan Award for Contributions to Faculty Governance. The award honors the memory of the late Professor of Psychology James Dougan and his staunch commitment to defend the faculty’s right to participate in shaping the direction of the University. The annual award, created by the Illinois Wesleyan chapter of the American Association of University Professors (AAUP), was announced by AAUP Chapter President Brian Brennan. In announcing the honor, Brennan read excerpts from several nominating letters that praised Roesner’s skill at building consensus, her commitment to service, and her compassion. An inorganic chemist, Roesner's teaching includes General Chemistry, inorganic chemistry courses, and the Gateway first-year writing seminar. Her current research projects include synthesizing astrochemically relevant mineral dusts to be studied by submillimeter spectroscopy and attaching polyoxometalates to solid supports to enhance their utility as oxidation catalysts. Roesner is also developing inorganic and materials chemistry projects for the undergraduate curriculum. These include measuring the physical properties of ferrocene and preparing metal oxide microparticles to be observed with the scanning electron microscope. Roesner has involved more than 50 Illinois Wesleyan students in her research projects, and her work has been published in Inorganic Chemistry, Advances in Inorganic Chemistry and The Chemical Educator. Active in service to the University, Roesner is chair of the chemistry department and currently serves as Faculty Secretary. She has previously served on several university-wide committees, including CUPP and Curriculum Council. She is an active member of the American Chemical Society and past president of the Illinois Wesleyan chapter of AAUP. For the past three years she has particularly enjoyed co-directing a summer program for incoming science students -- SPLICE (Science Program for Leadership, Inquiry, and Campus Engagement). 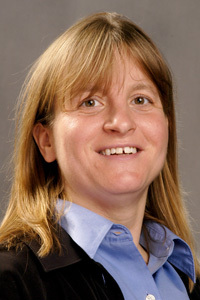 Roesner joined the Illinois Wesleyan faculty in 1997. She graduated from Ohio Wesleyan University with majors in chemistry and history, and earned a Ph.D. in inorganic chemistry from the University of Kansas.